Browsing for home office design ideas? Your home study is not the easiest room to design and furnish because it might need to fulfil various practical purposes – from catering to a full-time home worker to allowing space for the kids do revise and do homework. So how to get it right? The trick is to get the balance between decor – colour schemes, soft furnishings and wall art – and practical additions like storage and office furniture just right. If you home is slightly on the small side, having a space that is purely dedicated to working from home, may seem like an impossible dream. But just because you don’t have an extra room to turn into a home office, that doesn’t mean you can’t squeeze in a small desk and some essential office storage into your bedroom or living room. When you aren’t WFH the space could double up as a sideboard or a dressing table. A blackboard calendar wall sticker, from Ferm Living, allows the owner of this office in a colourful Victorian semi to keep track of appointments. The Mid-century desk was originally a dressing table bought on Ebay for £40. For a similar chair, try Made.com. Find out how to make a chalkboard with our clever tips and ideas. Reclaim the space under your staircase with a made-to-measure home office. Not only can office shelving be designed to fit right up to the underside, it’s a great opportunity to create a feature by displaying favourite items and photos. Opt for purpose-built office furniture so you can incorporate useful components, such as slide-out cupboard shelves that are ideal for housing printers and scanners or bulky equipment that you may not want on show. Alcoves are usually a pretty neglected space so put them to work and use the empty space create a small home office. Even if you cant squeeze in a desk you could install a wall mounted work surface with shelves and cupboards fitted above. Look for adaptable home office storage solutions to that can grow and be adjusted as your needs change. Open storage is also a great option for a home office, they are easier to keep organised and accessible. The storage system from String is incredibly versatile and can be built to perfectly fit your space, there are also drawers and cupboards too that can be added. If you have some extra-wall space in your home but not enough space to put an actual desk, go for a wall-mounted drop down desk, pair with an adjustable chair and modular, freestanding storage and you'll have an instant mini office. Proof that you can fit a home office into the smallest of spaces – a ladder desk includes everything you would expect from a home office but doesn't take up any precious square footage. If a fully fitted office is beyond your budget, find freestanding solutions that are more mobile. A double-sided desk is useful if you’re sharing the space, and opt for drawers on wheels that can be rolled under a desk and easily switched around for a fresh new look. Different colours affect our moods in different ways, so choosing the correct paint colour for the room you plan on working in is no small matter. While plain white may be tempting, an all-white room can create an overly clinical atmosphere. Surprisingly, the colour that has been revealed as the ultimate productivity booster is . . . orange. This does not mean that you have to paint your home office a garish shade; choose a stylish hue such as Book Room Red from Farrow & Ball. If reds and oranges don't appeal, try a combination of soothing greys, greens and blues. If you know you get easily distracted, yes maybe even a colourful wall is enough to pull you from your work, then choose a calming, neutral colour scheme. Sometimes it does take a polished, professional looking home office to get your motivated. This home office by Ikea is the perfect example, the wall of Liatorp book cases is perfectly uniform and we love the effect, almost like built in storage. The colour scheme is simple without being cold and the patterned rug stops the room from becoming too clinical. If you've got the room, why not copy this layout too? Having the desk in a central position makes it the focus of the room, plus is a good idea if you work with clients from home so you need seating on both sides of the desk. That on-trend cheese plant won't just look great on your office shelves, adding houseplants to the space can also help purify the air, apparently helps absorb noise (who knew?) and improve productivity. 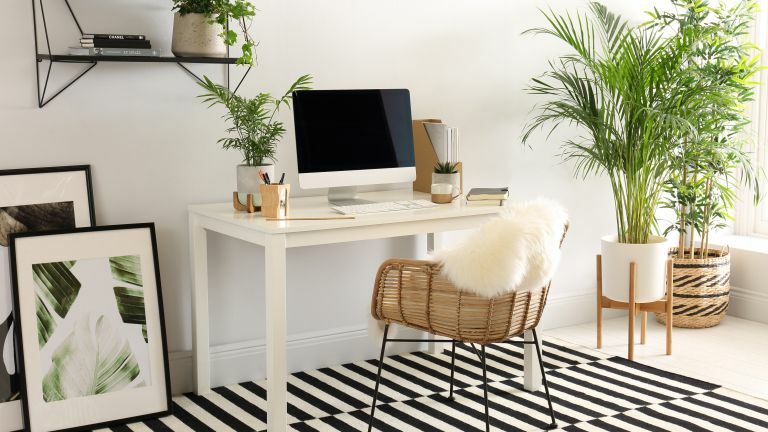 When choosing the right plant for your home office, consider the light levels it might require and its watering needs – staring at a brown, shrivelled plant isn't going to do much to boost motivation on a Monday morning. We all know that the key to WFM is having a designating place to work, a desk rather than say the kitchen table, or the sofa, or your bed. Physically sitting at a desk gets you into that "work mode" and a good, comfortable chair is all part of that mentality. So make sure you get your home office chair right, it's worth perusing reviews and testing out a few models before you pick. Be sure to check out some of our fave leather office chairs, traditional office chairs and ergonomic office chairs before you buy. A good work area needs plenty of light, but at the same time you don't want any glare on your laptop or computer. Black out blinds will obviously stop any glare issues but then you are sat in the dark, same goes for curtains. Shutters however will allow you to control the amount of light coming into the room throughout the day. Plus if you choose something like these California Shutters, in a statement colour they can be used to add a much need splash of colour to a home office.